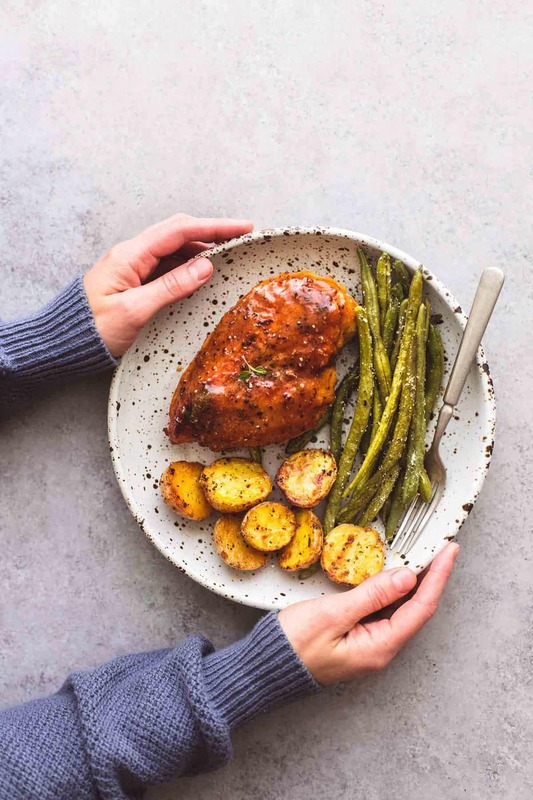 It doesn’t get any better than this easy one Sheet Pan Chicken, Potatoes and Green Beans recipe! Healthy, hearty, and a cinch to whip up – you’ll love everything about this dish! 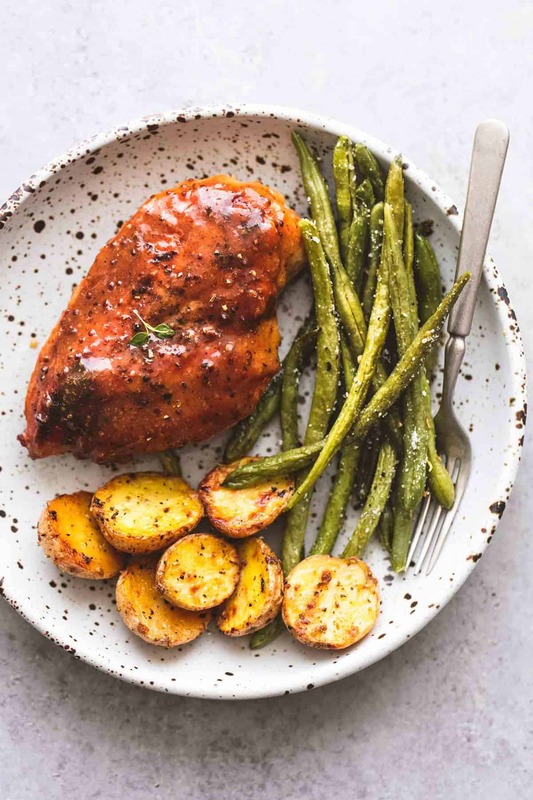 After you fall in love with this Sheet Pan Chicken, Potatoes and Green Beans meal, you’ve gotta try my favorite Healthy Sheet Pan Chicken Fajitas, and Sheet Pan Balsamic Chicken with Potatoes and Carrots. Holy sheet — she’s at it again! Yes, that’s right I’m back at it. Right back at making sheet pan meals, that is! I love them. Admit it, you do, too! What could be simpler than one meal, with all the goods (protein, veggies, carbs) and only one pan to clean up? Plus, I have to say, I’ve yet to create or come across a sheet pan recipe that’s been bad. There are soooo many ways to get creative, it’s nearly impossible to mess this up. When I got my cart back in the aisle properly (while trying to avoid making eye contact with the other shoppers), I found the baby gold potatoes just staring right at me. I grabbed those too. How serendipitous, I thought as I mentally added chicken to the dish and started to calculate the amount of spices needed for this recipe. While I’m at the store, I’d better make sure I have all the ingredients I need, right? I didn’t know the difference between the two for the longest time. Everyone seems to own at least one of these — but do you know which one you own? Making sure you’re cooking sheet pan recipes on an actual sheet pan and not a cookie sheet is important for one major reason: raised sides. While both are metal pans in rectangular shape, the sheet pans have four raised edges. These are important for holding your food and any juices or marinades in with the thing you are baking and to keep them from spilling out all over your oven, then burning on the bottom, then setting off your smoke detector and filling your house with a lovely, burned stench that lingers for days (just guessing here). Cookie sheets will have at least one raised side, but this is so you can grab a hold of it, take it out of the oven, and remove your cookies with ease. What other vegetables could I use with this recipe? 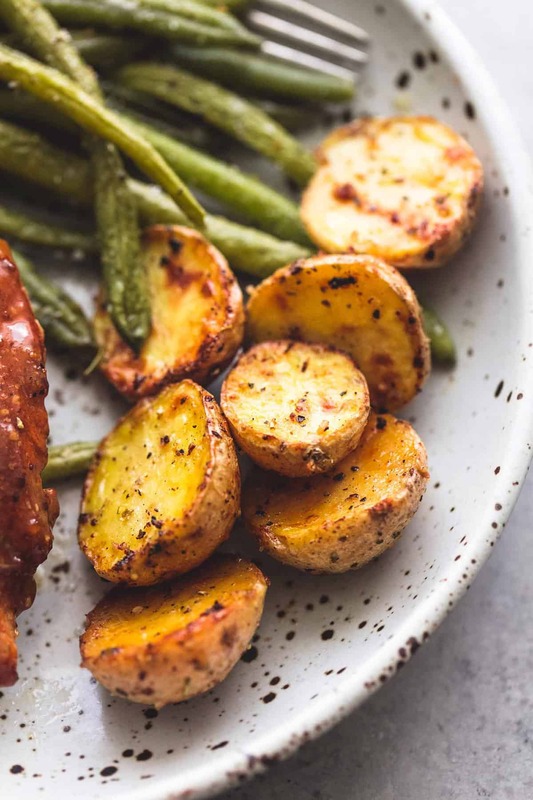 If you weren’t struck by the green beans and potatoes at the grocery like I was, or you want to whip together a simple dish with what you have on hand, by all means, feel free to experiment. 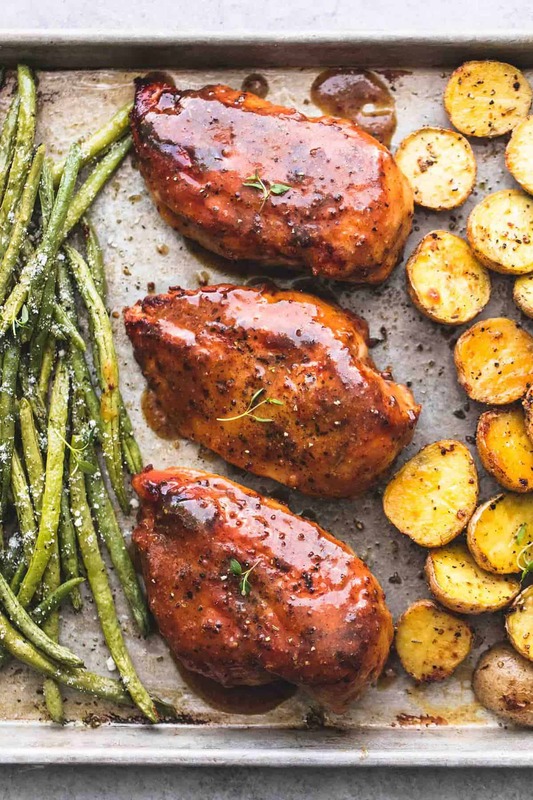 It’s important, though, to realize what can bake appropriately in a sheet pan in this recipe (for instance, you wouldn’t want to add rice because it would become hard and crunchy and not rice-like at all). Some good substitutes for the green beans include broccoli, cauliflower, asparagus, zucchini, or Brussels sprouts. If you don’t want to use baby gold potatoes, you can try another variety of potatoes, sweet potatoes, or a winter squash like butternut squash. Or you could double down with two veggies and no starch, potatoes and squash and no green veggies, etc. 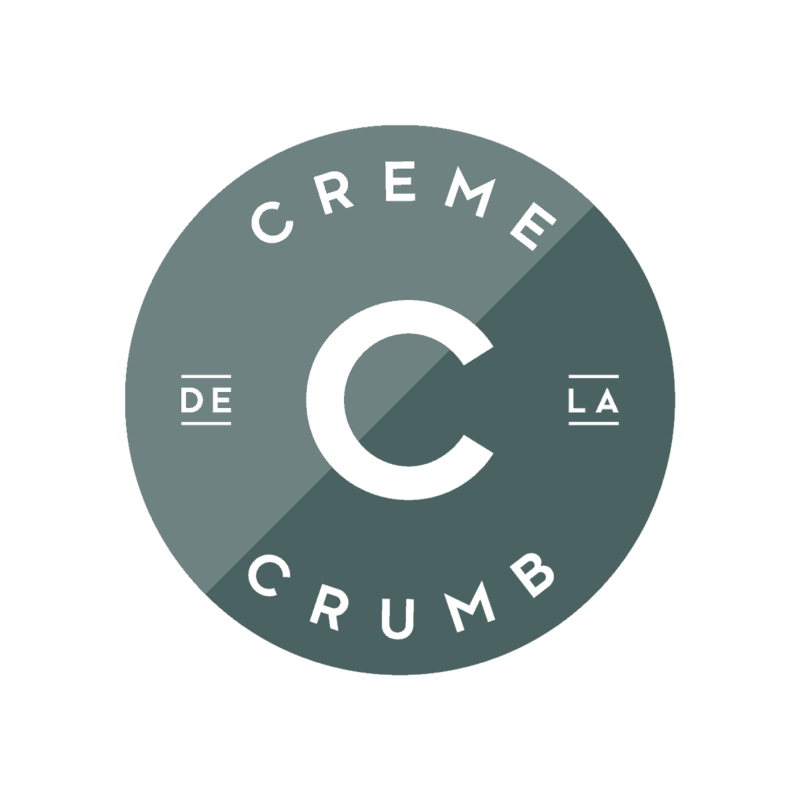 What other meats could I use with this recipe? They key here would be to make sure your meats are all of similar thickness and can be cooked in the 25 minutes allotted on this recipe. You could substitute pork chops, or a meatier fish like tuna, salmon, or snapper. You can, of course, always cook your meat longer, but you should remove your vegetables first when they are done. Or, alternately, if you have a fast-cooking fish like salmon, you might to pop your veggies in the oven first to give them a head start. *No toddlers were hurt in the making of this recipe. 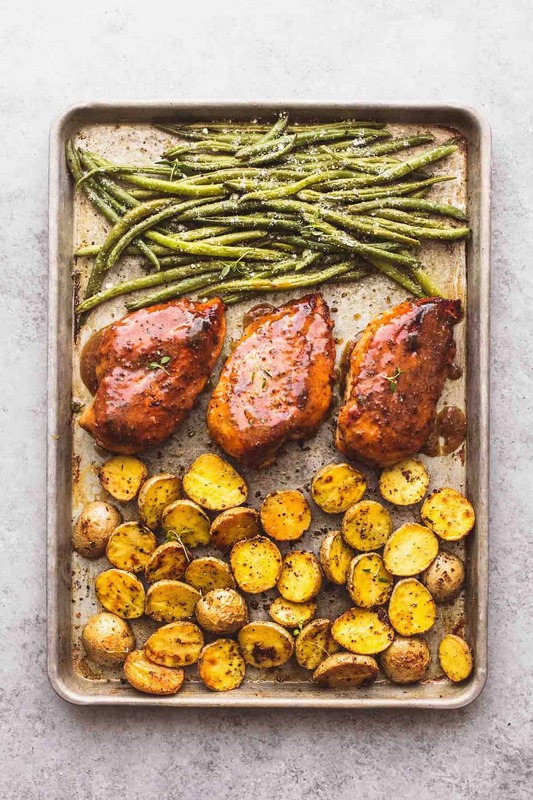 It doesn't get any better than this easy one Sheet Pan Chicken, Potatoes and Green Beans recipe! Healthy, hearty, and a cinch to whip up - you'll love everything about this dish! Preheat oven to 400 degrees. In a medium sauce pan, melt butter. Stir in honey, garlic, salt and pepper. Bring to a boil, then reduce to a simmer. Remove from heat and set aside. Pound chicken to even thickness. 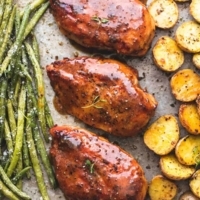 Arrange green beans, chicken breasts, and potatoes on a large sheet pan. Drizzle with oil, then season with salt and pepper to taste. Stir together Italian seasoning, garlic powder, and smoked paprika. Sprinkle seasoning over veggies and chicken. Pour honey sauce over chicken. Bake for 20-25 minutes until veggies are tender and chicken is cooked through. Sprinkle parmesan cheese over green beans and potatoes, then serve. perfect, one pan one whole dinner and easy too, thank you! It tastes delicious after making it tonight but the sauce is very thin. You say to reduce heat on sauce and to simmer but don’t say for how long. My chicken came out pale; not at all like the GLaze in the picture. Once the boil becomes a simmer (no longer a rapid boil), remove it from the heat. If you are looking for more color on your chicken you could try browning it before placing it in the oven.